CSA Week #1: Salad and dressing. CSA items marked with an *. Cook chickpeas ahead of time. Toast almonds in 350 oven for 10 minutes. Clean and chop lettuces. Slice radishes thinly. Grate the carrots. Cube the apple. Slice the grapes in half. Chop up garlic scapes and scallions and combine with all ingredients in the processor. Pour most of the dressing over the lettuces. Combine well. 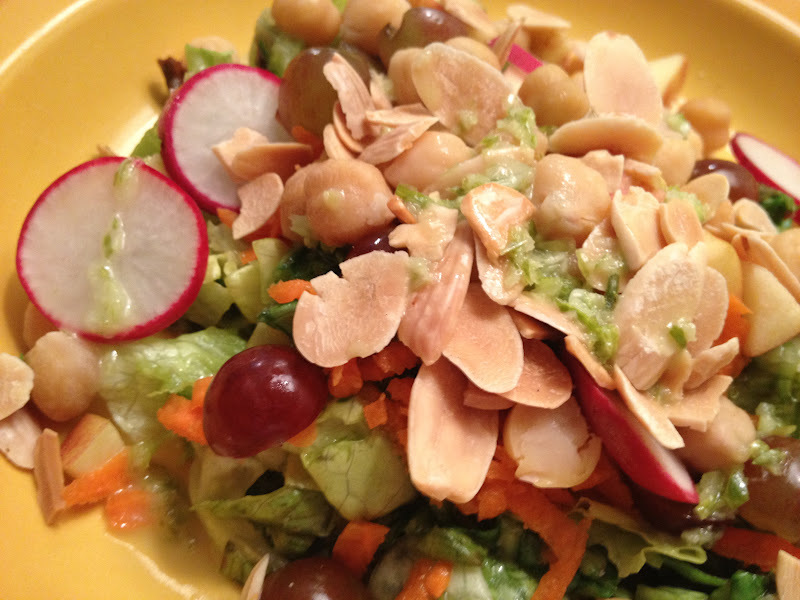 Place the lettuces on a plate and top with chickpeas, radishes, carrots, apples, grapes and toasted almonds. Drizzle a little more dressing on top. Enjoy!